There will be a couple of giveaways that I will host for all read-a-thon participants. It's really going to be a great time!!! Authors! The read-a-thon isn't limited to just readers. Join in the fun with a guest post & giveaway! This can be great exposure for you. 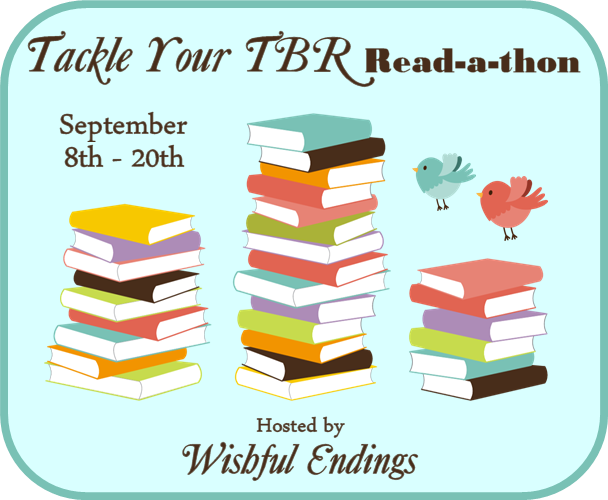 You don't have to be participating as a reader to post a challenge or giveaway. There is a requirement that your book not be erotica or contain mature content as this is a family-friendly blog (if you're not sure, or your book is borderline, then just ask - I just don't want steamy covers, erotica, or a lot of heavy swearing). To get more information and see about signing up, just fill out THIS FORM! Post your sign-up using the button that links back to this post. Then enter the link to your post in the linky below, post the button on your sidebar with a link back to this post or your sign-up post, and spread the word (remember on Twitter to use #TackleTBR), and comment or email with questions. Then on September 8th come back here looking for some fun giveaways and challenges, and be prepared to link up your goals (if you didn't include them in your sign-up post). Thanks for the great giveaways! I was going to do this but decided to wait for the Spooktacular Giveaway Hop that happens every Halloween. I have some great books to giveaway.